Bio-Instructive Scaffolds for Musculoskeletal Tissue Engineering and Regenerative Medicine explores musculoskeletal tissue growth and development across populations, ranging from elite athletes to the elderly. The regeneration and reparation of musculoskeletal tissues present the unique challenges of requiring both the need to withstand distinct forces applied to the body and ability to support cell populations. 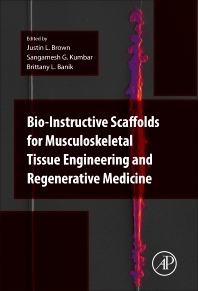 The book is separated into sections based on tissue type, including bone, cartilage, ligament and tendon, muscle, and musculoskeletal tissue interfaces. Within each tissue type, the chapters are subcategorized into strategies focused on cells, hydrogels, polymers, and other materials (i.e. ceramics and metals) utilized in musculoskeletal tissue engineering applications. In each chapter, the relationships that exist amongst the strategy, stem cell differentiation and somatic cell specialization at the intracellular level are emphasized. Examples include intracellular signaling through growth factor delivery, geometry sensing of the surrounding network, and cell signaling that stems from altered population dynamics. Justin Brown is an Associate Professor of Biomedical Engineering at the Pennsylvania State University. He received his Ph.D. (Biomedical Engineering) and studied as a postdoctoral fellow (Cell and Molecular Biology) at the University of Virginia. His Ph.D. research focused on the use of novel biodegradable polyphosphazenes and poly(L-lactide) to construct novel scaffolds for bone tissue engineering presenting both micro and nanostructures. His postdoctoral research focused on MAPK signaling in osteoblasts in response to synthetic nanofiber architectures. His current research interests are fundamental mechanisms stem cells use to sense and respond to translational biomaterial interfaces. Brittany Banik is a Graduate Research Assistant in the Department of Biomedical Engineering at The Pennsylvania State University. She received a B.S. in Bioengineering and minor in Mathematical Sciences from Clemson University. She currently works as a National Science Foundation Graduate Research Fellowship Program (NSF GRFP) fellow in Dr. Justin Brown’s Musculoskeletal Regenerative Engineering Laboratory. Her Ph.D. research investigates a novel scaffold design for tendon tissue engineering. She has previously been involved in projects related to nanomedicine, drug delivery, and cellular mechanotransduction.